Flange tables are an often missed critical factor in any system build, and incorrectly ordered flanges can lead to delays on the job. Prior to specification or ordering of any plastic pipe flanges, the PCD / drilling of the connecting flange should be determined. 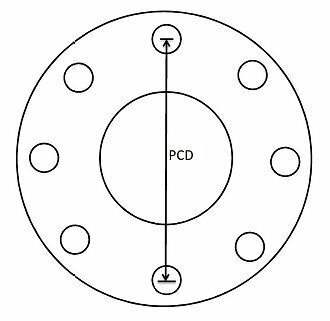 The PCD is the measurement from the centre of one bolt hole, across the middle of the flange, to the centre of the opposite hole. The likelihood is that, if you are in Europe, the drilling will be either PN6, PN10 or PN16. If it is an old piece of equipment you are connecting the plastic pipe to, such as a pump or filter, the flange may be a BS10 drilling. If it is an imported piece of equipment from North America, the drilling could well be ASA150 (or ANSI). Once you have your PCD measurement, look it up on the flange drilling tables below. This is pretty straightforward. If you do not have the same drilling on both flanges, the bolt holes won't line up and you won't be able to connect them. Once you have your PCD measurement, look it up in the tables below to determine the drilling standard. Note: PN10/16 - Some flanges are denoted PN10/16. These refer to the fact that either PN10 or PN16 flanges will fit, as the drillings for many sizes are the same. If you are still unsure of which flanges are right for your application, please call us - we are always happy to help and would rather you got the right ones first time!